Requires no monthly fee to play. An access key for account upgrade. Access to the Dapper Tuxedo costume. Dress your female character for a formal occasion in this fitted lady's tuxedo that comes with a jaunty matching top hat. The stylish gentlemen's tuxedo and top hat will give your male character an equally sophisticated look. This item fits into the costume slot on your character panel and can be worn over existing armor. How to redeem - Once the the Dapper Tuxedo serial key is applied to your account, speak with the [Costume Maker] located in Lion's Arch, Shing Jea Monastery, Kamadan, and the Great Temple of Balthazar. This NPC will provide you with your costume. 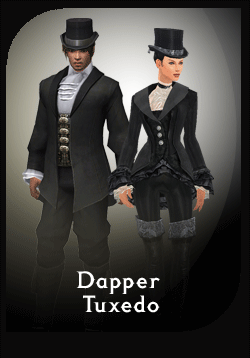 Once purchased, any character on your account can speak to the [Costume Maker] to receive their own Dapper Tuxedo. ©2010–2014 ArenaNet, LLC and NC Interactive, Inc. All rights reserved. Guild Wars, Guild Wars 2, ArenaNet, NCSOFT, the Interlocking NC Logo, and all associated logos and designs are trademarks or registered trademarks of NCSOFT Corporation. All other trademarks are the property of their respective owners.